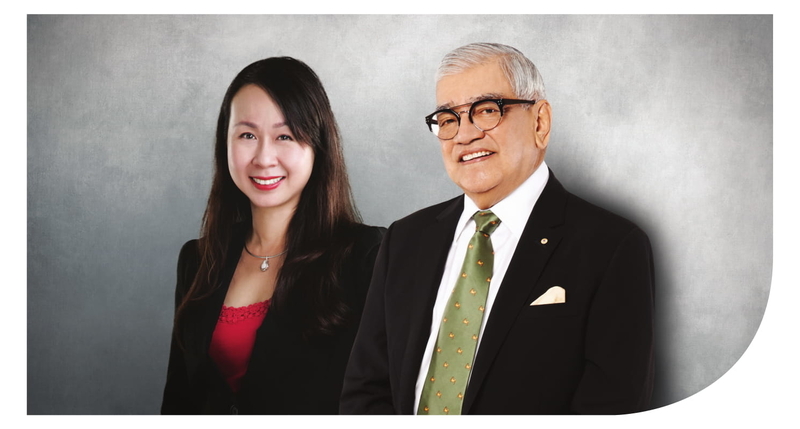 On behalf of the Board of Directors (“Board”) of Axis REIT Managers Berhad (“ARMB” or “Manager”), we are pleased to note that Axis Real Estate Investment Trust (“Axis-REIT” or “Fund”) delivered another solid operational and financial performance during the Financial Year Ended 31 December 2018 (“FYE2018”). The results are the outcome of our continued focus on Axis-REIT’s aim of building a portfolio of high-quality industrial assets that generate sustainable, long-term returns to our Unitholders. Notwithstanding the cautious business outlook in the run up to Malaysia’s 14th General Election (“GE14”) and the stunning results that followed, there was no let-up in our focus and execution of the Fund’s strategy in 2018. 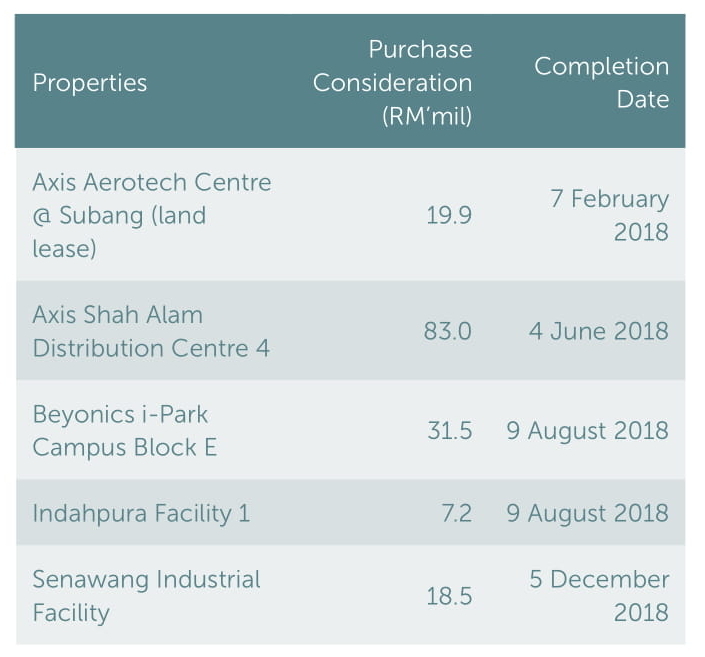 During the year, we added five properties to Axis-REIT’s portfolio, bringing the total count to 45 properties valued at RM2.8 billion, with a cumulative net lettable area (“NLA”) of over 9.3 million sq. ft.. These, alongside property acquisitions completed in 2017, and the commencement of the lease term at the Fund’s maiden development project, were the key drivers of the Fund’s bottom line growth in FYE2018. We recorded strong operating metrics in FYE2018, having successfully raised the occupancy rate of our property portfolio to 94% as at 31 December 2018, while achieving a 5% positive rental reversion during the year. The Leasing Team renewed tenancies for 74% of the 1.4 million sq. ft. of space that was due for renewal in 2018, and in total, secured tenancies (including renewals and new tenancies) for 1.6 million sq. ft. of space during the year. The portfolio’s weighted average lease expiry (“WALE”) remained stable, at 5.57 years as at 31 December 2018. Axis-REIT’s financial results reflect these operational achievements, with net property income rising 25% to RM182.8 million in FYE2018, bringing income available for distribution to RM107.8 million as at 31 December 2018. The Fund declared a distribution per Unit (“DPU”) of 8.74 sen for FYE2018, up 6% from the preceding year. This translates to a commendable distribution yield of 5.6% per unit, based on Axis-REIT’s closing unit price of RM1.56 as at 31 December 2018. The Fund also successfully completed its 2018 Income Distribution Reinvestment Plan (“IDRP”), which garnered a 55% reinvestment rate, with the issuance of 4.9 million new Units pursuant to the exercise. The 2018 IDRP generated net proceeds of RM6.8 million that were deployed towards asset enhancement initiatives of the property portfolio. Over the years, we have prudently maintained Axis-REIT’s gearing level below the regulatory limit of 50% for Malaysian REITs and will continue doing so moving forward. As at 31 December 2018, Axis-REIT’s gearing stood at 37%, up from 33%, following the drawdown of financing facilities to fund its asset acquisitions and property development ventures. We are comfortable that at this level, the Fund has sufficient headroom to pursue acquisitive and development opportunities. During FYE2018, Axis-REIT’s 5-year Sukuk, amounting to RM85 million, matured and was fully-redeemed, using existing credit facilities. 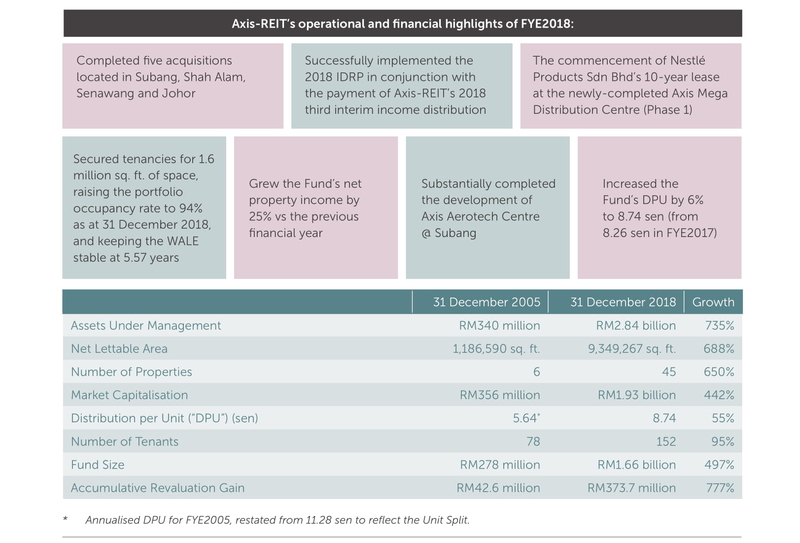 Following the redemption of the 5-year Sukuk, Axis-REIT had RM180 million in outstanding Sukuk facilities as at 31 December 2018. In January 2019, the Fund concluded its third Sukuk issuance, which saw the Fund issue RM240.0 million in unrated, 7-year Sukuk. The proceeds were mainly applied to refinance existing short term credit facilities as part of our strategy to further strengthen the Fund’s debt maturity profile. The unprecedented results of GE14 saw a change in Malaysia’s political leadership for the first time since the country’s independence in 1957. The results of the elections and the orderly, peaceful transition in leadership were widely lauded, demonstrating a matured democracy and the ability of Malaysians to move forward as a nation. Despite some initial uncertainties over the new government’s policies as well as some external macroeconomic headwinds, the country’s Gross Domestic Product (“GDP”) recorded commendable growth of 4.7% in 2018, driven by resilient private sector spending, an uptick in net exports and continued expansion in the services and manufacturing sectors. Looking ahead, analysts and economists are expecting stable economic growth for Malaysia in 2019. Government official forecasts, published in November last year, had pegged GDP growth at 4.9% for 2019, while the World Bank estimated the country’s GDP growth at 4.7% in 2019. We are confident that Axis-REIT’s portfolio is well-positioned for growth in the coming years. Our strategy of building a solid business and industrial space portfolio has and continues to pay off – demand for properties within these segments has been relatively resilient amid growth in the e-commerce and manufacturing sectors. Our properties, which are located in the country’s key industrial hubs and in strategic urban locations, offer seamless access to transport networks and are well-positioned to benefit from this demand. Our recent investments have strengthened our position in the industrial space segment – all five acquisitions completed in FYE2018, including the land lease of Axis Aerotech Centre @ Subang, were in the industrial property category. With these additions, industrial properties now account for 91% of Axis-REIT’s portfolio. 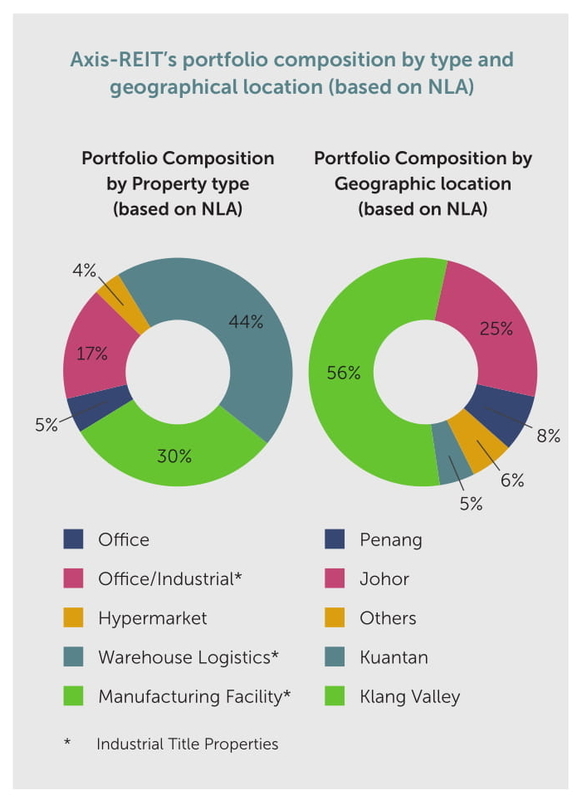 While our portfolio focus remains very much in the industrial property segment, we also continue to grow our portfolio beyond the central / Klang Valley region. Our recent acquisitions included additions to our presence in the rapidly-growing key industrial hubs of Penang and Johor (Iskandar Malaysia). This geographical diversification is aimed at capturing the rapid growth of these burgeoning regional industrial hubs. Looking ahead, we have executed a letter of offer to acquire another industrial property, located in Bayan Lepas, Penang, for a total consideration of RM20.5 million. The acquisition is currently underway, and is expected to be completed in FYE2019. Beyond this, we expect a robust pipeline of investment opportunities in 2019. We continually review our property portfolio, leveraging on our industry insights to re-assess and re-evaluate the portfolio, to ensure it remains well-positioned to meet the future needs of our tenants and the broader market. We believe that industrial properties will continue to generate stable, sustainable returns for our Unitholders, and while we remain cautious over the outlook of the office segment, we note sustained demand for well-located, Grade A office space. We also continue to work closely with our existing and new tenants to deliver real estate solutions to match their growing needs, as demonstrated in the development of the Nestlé Distribution Centre at Axis Mega Distribution Centre, and Axis Aerotech Centre @ Subang. We believe the success of the Fund’s first two property development projects sends a strong message of our capabilities as a property developer and a business space partner. Navigating and managing Axis-REIT’s evolving business risks are embedded in our day to day operations. Management has in place a Risk Register, to help identify, evaluate and mitigate risks and potential risks. Through consultation with the Audit Committee, Internal Auditors and the Board, we continuously review and update the Risk Register to ensure it remains relevant and current to Axis-REIT’s operations. During FYE2018, updates to the Risk Register included revisions to processes and procedures to ensure compliance with the revamped Main Market Listing Requirements of Bursa Malaysia Securities Berhad, as well as the Securities Commission’s new Guidelines on Listed Real Estate Investment Trusts, that came into effect on 9 April 2018. Axis-REIT is committed to being a responsible corporate citizen, and we remain mindful of the environment in which we operate, as well as the needs of the various stakeholders we serve and the community around us. We continuously strive to improve our environmental sustainability performance, which includes reducing our carbon footprint through improving energy efficiencies throughout our portfolio of properties, and adopting environmentally sustainable practices throughout our operations. We also invest in programmes to benefit the communities around us via our Corporate Social Responsibility (“CSR“) initiatives, that are aimed at educating and improving the welfare of vulnerable groups, while concurrently fostering good ties with various stakeholders. Our CSR programmes in FYE2018 included donating back-to-school sets to underprivileged students, organising a charity bazaar, collaborating with the Royal Institution of Surveyors Malaysia in organising a charity run, working with the National Blood Bank on two blood donation drives, and sponsorship of the Axis O2FC Football Team. Details of these programmes can be found in the Fund’s 2018 Sustainability Report, which we are pleased to note, is Axis-REIT’s inaugural Integrated Sustainability Report. The report is presented on pages 130 to 158 of this Annual Report. At the heart of what we do are our people, who continue to take Axis-REIT from strength to strength, with their tireless efforts in conceiving, planning and executing the Fund’s strategies and plans effectively and efficiently. On behalf of the Board, we acknowledge and thank the team for their vision, commitment and diligence that has been instrumental in the Fund’s success. The results of the Team’s efforts are clearly demonstrated in the Fund’s solid operational and financial results. We are also proud to note acknowledgements of the Team’s efforts from the broader industry, with Axis-REIT being named as the winner of the 2018 Asia Pacific Best of the Breeds REITs Awards in the Industrial REIT (Malaysia) and Islamic REIT (Malaysia) categories. The Fund was also a Merit Award recipient for the National Annual Corporate Report Awards (“NACRA”) for its 2017 Annual Report. We also express our gratitude to our tenants and business partners for continuing to work with us as your business space partner, our Unitholders and the investment community, for your confidence in our ability to deliver results, and members of the media, real estate agents and members of the community for your continued support. With a strong portfolio, sound financial position and exciting pipeline of opportunities, we are optimistic that Axis-REIT is well-positioned for sustainable growth in the years to come.